It is no secret around here that I love anything with lemon. I seem to be always working with lemon in my kitchen. So if you love lemon as much as I do then there is definitely no shortage of recipes for you. Be sure to try some of them out, like Chewy Lemon Drop Cookies, Lemon Ice Cream, Homemade Lemon Curd, Lemon Marshmallow Tart or Lemon Muddy Buddies just to name a few. And here we are today adding to the lemon category again. 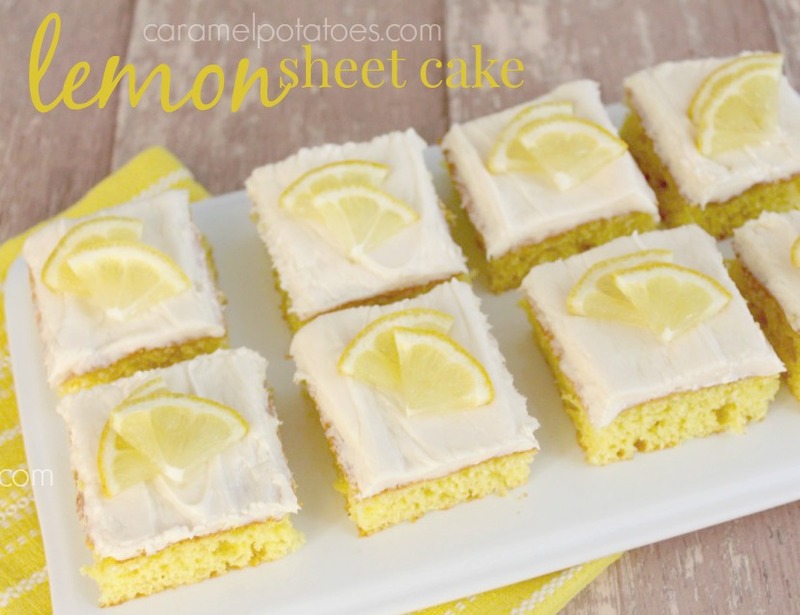 This Lemon Sheet Cake could not get any easier and is is absolutely bright and full of flavor all the while staying light and moist. 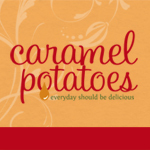 Plus you know that here at Caramel Potatoes we love to feed a crowd with the other great sheet cakes: Cream Cheese Sheet Cake, Peanut Butter Sheet Cake, Texas Sheet Cake, and one of my most favorite sheet cakes ever Blonde Texas Sheet Cake with Caramel Pecan Frosting. In a large mixing bowl, beat the cake mix and eggs until well blended. Fold in pie filling. Spread into a greased jelly roll pan. Bake at 350 for 18-20 minutes or until a toothpick inserted near the center comes out clean. Cool completely on wire rack. To make the frosting: In a mixing bowl, beat cream cheese, butter and powdered sugar until smooth. Stir in vanilla. Spread over cake. Store in refrigerator. *Recipe slightly adapted from Taste of Home Magazine June/July 2003.